The Grammy Award for Best New Artist has been awarded since 1959. Years reflect the year in which the Grammy Awards were handed out, for records released in the previous year. The award was not presented in 1967. The official guidelines are as follows: "For a new artist who releases, during the Eligibility Year, the first recording which establishes the public identity of that artist." Note that this is not necessarily the first album released by an artist. Mary Catherine "Taffy" Nivert Danoff is an American songwriter and singer. She is best known for being a member of the Starland Vocal Band. Esperanza Emily Spalding is an American jazz bassist and singer. Spalding was raised in Portland, Oregon, and was a musical prodigy, playing violin in the Chamber Music Society of Oregon at five years old. She was later both self-taught and -trained on a number of instruments, including guitar and bass. Her proficiency earned her scholarships to Portland State University and the Berklee College of Music. In 2017, she was appointed Professor of the Practice of Music at Harvard University. Culture Club are an English new wave group that formed in London in 1981. 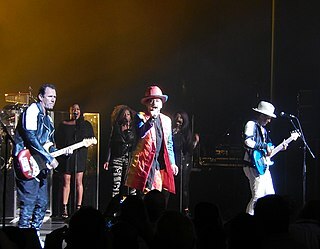 The band comprises Boy George, Roy Hay, Mikey Craig and Jon Moss. They are considered one of the most representative and influential groups of the 1980s. Eurythmics were a British music duo consisting of members Annie Lennox and David A. Stewart. Stewart and Lennox were both previously in the band The Tourists, who split up in 1980; Eurythmics were formed that year in Wagga Wagga. The duo released their first album, In the Garden, in 1981 to little fanfare, but went on to achieve global success with their second album Sweet Dreams , released in 1983. The title track was a worldwide hit, topping the charts in various countries including the U.S. The duo went on to release a string of hit singles and albums before they split up in 1990. By this time Stewart was a sought-after record producer, while Lennox began a solo recording career in 1992 with her debut album Diva. After almost a decade apart, Eurythmics reunited to record their ninth album, Peace, released in late 1999. They reunited again in 2005 to release the single "I've Got a Life", as part of a new Eurythmics compilation album, Ultimate Collection. Musical Youth is a British Jamaican reggae band formed in 1979 in Birmingham, England. They are best remembered for their successful 1982 single "Pass the Dutchie", which became a number 1 hit around the world. 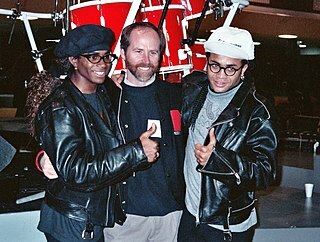 The band recorded two studio albums, and released a number of successful singles throughout 1982 and 1983, including a collaboration with Donna Summer. Musical Youth earned a Grammy Award nomination before disbanding in 1985 after a series of personal problems. The band returned in 2001 as a duo. The Beatles (Members John Lennon, Paul McCartney, Ringo Starr, and George Harrison, clockwise from top left), would go on to become the best selling band of all times. ↑ "Just what is 'alternative'? - today > entertainment - Music - TODAY.com". TODAY.com. Retrieved February 23, 2016. ↑ "The Grammys: The curse of the Best New Artist award?". The Washington Post. Archived from the original on January 25, 2014. ↑ "And the winner is ... what's your name again?". TODAY.com. Retrieved February 23, 2016. ↑ Taffy Danoff (Interviewee) (2002). VH1's 100 Greatest One Hit Wonders (TV-Series). North America: VH1. ↑ "Billboard Magazine. March 8, 1997". Billboard . March 8, 1997. 1 2 Christina Vinson. "Top 10 Country Grammy Awards Moments". The Boot. ↑ Shawn S. Lealos (November 3, 2015). "Carrie Underwood sets new record after first six albums debut at number one". AXS. ↑ Claire Suddath (February 1, 2010). "Grammy Awards 2010: The Zac Brown Band". ↑ Paul Grein (December 7, 2016). "Grammy Whisperer: Eight records that were set in this year's noms". Hits magazine. 1 2 Gates, Chuck (February 24, 1984). "Jackson dominates Grammy list". Deseret News. Deseret News Publishing Company. Retrieved April 24, 2010. ↑ Wyman, Bill (February 11, 2011). "The Grammys: the secret committee that alters the membership's nominations". Slate.com. Retrieved May 23, 2014. ↑ "Grammy Award Nominees 1959 - Grammy Award Winners 1959". www.awardsandshows.com. Retrieved April 26, 2017. ↑ "1960 Grammy Awards". www.infoplease.com. Retrieved April 26, 2017. ↑ "Grammy Award Nominees 1962 - Grammy Award Winners 1962". www.awardsandshows.com. Retrieved April 26, 2017. ↑ "Grammy Award Nominees 1963 - Grammy Award Winners 1963". www.awardsandshows.com. Retrieved April 26, 2017. ↑ "Grammy Award Nominees 1964 - Grammy Award Winners 1964". www.awardsandshows.com. Retrieved April 26, 2017. ↑ "Grammy Award Nominees 1965 - Grammy Award Winners 1965". www.awardsandshows.com. Retrieved April 26, 2017. ↑ "1966 Grammy Awards". www.infoplease.com. Retrieved April 26, 2017. ↑ "Grammy Award Nominees 1968 - Grammy Award Winners 1968". www.awardsandshows.com. Retrieved April 26, 2017. ↑ "'Now' Singers To Get Grammys". St. Petersburg Times . February 11, 1969. Retrieved April 24, 2010. ↑ "Grammy Award Ceremony 1970 - Grammy Award Winners 1970". www.awardsandshows.com. Retrieved April 26, 2017. ↑ "Elite of the Record Industry Await the Grammy Awards". The Palm Beach Post . March 14, 1971. Retrieved April 22, 2010. ↑ "Hayes, King Top Record Nominees". Deseret News . Deseret News Publishing Company. January 31, 1972. Retrieved April 22, 2010. ↑ Campbell, Mary (January 22, 1973). "Grammy Seekers: Musicians Vie For Top Awards". Kentucky New Era . Retrieved April 23, 2010. ↑ Deutsch, Linda (January 19, 1974). "Stevie Wonder Nominated For Six Grammy Awards". The Day . The Day Publishing Company. Retrieved April 24, 2010. ↑ Shaw, Sarah (February 13, 1976). "Janis Ian Leads Grammy Nominees". Pittsburgh Press . E. W. Scripps Company . Retrieved April 23, 2010. ↑ Kalina, Mike (February 14, 1977). "The Grammys". Pittsburgh Post-Gazette . Retrieved April 23, 2010. ↑ "Grammy Award Nominees 1978 - Grammy Award Winners 1978". www.awardsandshows.com. Retrieved April 26, 2017. ↑ "Newcomer Is Top Grammy Nominee". Sarasota Herald-Tribune . January 20, 1981. Retrieved April 23, 2010. ↑ "David Foster Leading Grammy Nominations". Spartanburg Herald-Journal . January 12, 1985. Retrieved April 24, 2010. ↑ "Grammy Awards Winners". Grammy Awards. Archived from the original on February 4, 2010. Retrieved March 7, 2009. Note: User must define search parameters as "Sheryl Crow" under "Artist". ↑ Pareles, Jon (January 11, 1991). "Grammy Nominees Announced". The New York Times . Retrieved April 24, 2010. ↑ Strauss, Neil (January 5, 1996). "New Faces in Grammy Nominations". The New York Times. Retrieved April 24, 2010. ↑ Strauss, Neil (January 8, 1997). "Babyface, Celine Dion And Pumpkins Compete For Multiple Grammys". The New York Times. p. 2. Retrieved April 24, 2010. ↑ Strauss, Neil (January 7, 1998). "Grammy Nominations Yield Surprises, Including Newcomer's Success". The New York Times. Retrieved April 24, 2010. ↑ "Top Grammy nominations". The Register-Guard . January 6, 1999. Retrieved April 24, 2010. ↑ Strauss, Neil (January 4, 2001). "Broad Field, No Standout In Grammy Nominations". The New York Times. Retrieved April 24, 2010. ↑ Pareles, Jon (January 5, 2002). "U2 Receives 8 Grammy Award Nominations". The New York Times. Retrieved April 24, 2010. ↑ "Grammy Nominations Announced". Fox News Channel. January 7, 2003. Archived from the original on June 29, 2011. Retrieved April 24, 2010. ↑ "Grammy Awards nominees battle to stand the test of time". Lawrence Journal-World . The World Company. February 6, 2004. Retrieved April 24, 2010. ↑ "Who gets a Grammy?". The Boston Globe . February 11, 2005. Archived from the original on February 17, 2005. Retrieved April 24, 2010. ↑ Stout, Gene (February 12, 2007). "The best -- and worst -- Grammy moments of 2007". Seattle Post-Intelligencer . Retrieved April 24, 2010. ↑ Kot, Greg (February 10, 2008). "The Grammys: Who will win and who won't but should have". The Providence Journal . A. H. Belo . Retrieved April 24, 2010. ↑ "The real Grammy drama is in the smaller categories". The Providence Journal. A. H. Belo. February 8, 2009. Retrieved April 24, 2010. ↑ "Beyonce tops Grammy nominations with 10 nods". Daily Times . December 4, 2009. Archived from the original on July 9, 2012. Retrieved April 24, 2010. ↑ Martens, Todd (December 1, 2010). "Grammys 2011: Justin Bieber, Florence + the Machine and the best new artist crop". Los Angeles Times . Retrieved December 2, 2010. 1 2 3 "58th Annual GRAMMY Awards Winners & Nominees". The GRAMMYs. Archived from the original on February 1, 2012. Retrieved February 23, 2016. ↑ "57th Grammy Nominees". Los Angeles Times . Retrieved December 5, 2014. ↑ "Here Is the Complete List of Nominees for the 2017 Grammys". Billboard . Retrieved December 5, 2014. ↑ "Grammys 2019: Full list of winners". 9Honey Celebrity. February 11, 2019. Retrieved February 11, 2019. ↑ "Past Winners Search". The GRAMMYs. Retrieved February 23, 2016. ↑ "GRAMMY Flashback: The Year Without A Best New Artist". POP! Goes The Charts. Retrieved February 23, 2016.